Sewing machine hand vacuum cleaner. Instead of blowing dirt and lint further into crevices, use these attachments to clean your sewing machine, serger, VCR, and computer keyboard. 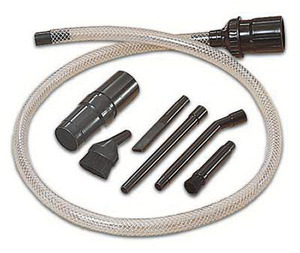 Includes special adaptor to attach to any vacuum hose, oval and round brushes, crevice tool, and two extensions. Works With Miele Vacuums, Bosch, Sebo, Hoover, Eureka, Shark, Electrolux, Bissell, Dirt Devil, Fuller Brush and more.